A mist coolant system sprays fluid onto the saw blade and the material being cut. This helps to decrease cutting heat produced while also keeping the blade lubricated. It is recommended for both small and large cutting processes. Bandsaw machines offer two types of coolant set up: flood and mist. Mist coolant systems achieve good blade lubrication, providing a cleaner work environment. They require the use of a standard air line or stream that creates suction to help draw fluid from a pump to meet air and form a mist spray. The lubricant is applied directly to the saw blade either through a spray hose or a nozzle head. The mist system is evenly balanced to effectively lubricate the blade without excessive spray mist and to maximize the amount of fluid to be used. The mist coolant system is designed to lengthen bandsaw blade life, reduce fluid consumption and waste, produces recyclable dry chips, and increases productivity. It helps to keep the blade pitch-free, maintains a clean band, reduces heat, and improves cutting performance. A mist coolant system is effective in pipe and tube cutting applications. Micro drop coolant array is designed to help eliminate fog build-up for a cleaner shop and greater chip clearing power, allowing for faster speed and feed. Two cutting fluids are used with a misting system: full and semi-synthetic sawing fluids. They both provide better tank life and high lubricity, but keep in mind that some cutting fluids are less safe to use while others are safer to breathe in and dispose. It is important to check the cutting fluid for containment of harmful chemicals like chlorine, sulfur, silicon, petroleum, or sulfonate. Cutting fluids resistant to corrosion, mold, and bacteria growth are also something to consider before purchase. Mist coolant systems are harmless to the machine, parts, and operator, but it is essential to choose and use a safe lubricant for every bandsaw procedure. At SawBlade.com, we offer C-2000 Semi-Synthetic and C-3000 Full Synthetic coolants. Both fluids are designed specifically for safe metal working and machining processes. Bandsaw coolant systems will offer a faster, more clean cut. It is important to remember that the best mist coolant system depends on the type of bandsaw machine being used, the cutting application, and choice of coolant solution. 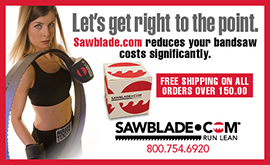 This entry was posted in All Posts and tagged #bandsaws, #SawBlades, coolants, lubricants, machinists, mist coolant system, saw blades, sawblade.com, woodworkers. Bookmark the permalink.